Can you make your fortune on the beach? 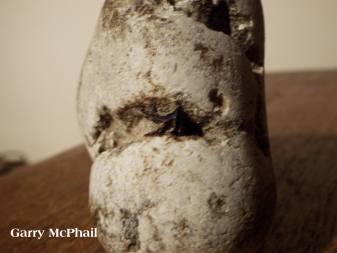 There are always lots of questions about possible ambergris finds on the beach. Why? 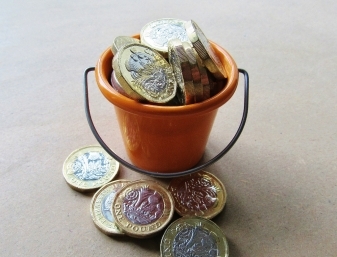 Because a decent find can still bring the finder a great deal of money! Ambergris (from the French for Grey Amber) has long been used as an ingredient in perfume. Which seems perfectly reasonable until you realise that it is actually sperm whale poop - fancy dabbing it under your ears now? Ambergris is useful in helping the scent last longer. While most perfume is now made using a synthetic substitute for ambergris, there is still some demand for it from old-fashioned perfume makers from around the world. And because it is very rare (only sperm whales produce it, and only a very small proportion of sperm whales, and even then it can float around in the sea for years before it lands on a beach), it can command high prices. Looking on ebay today, there is ambergris for sale for around $1000 for 100g (which works out at about £800 for something the weight of an apple). Seems like an excellent way to make some cash! There's lots of lumpy waxy stuff to be found on beaches (unfortunately) so how do you know if you have found ambergris? 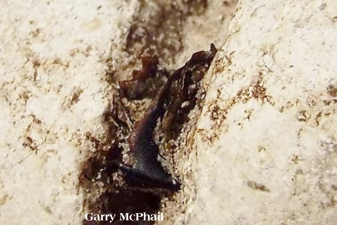 Ambergris is usually a dull grey colour but can be much darker as in the photo above. It has a slightly waxy feel (but not as waxy as, say, a candle) and can be brittle (although if you break up your ambergris lump in order to find out if it is valuable ambergris, it will no longer be as valiable... It can have a slight fish poo smell but this can fade with age. Paraffin oil and palm oil are common finds on beaches. And both can grey or darken with age. However, both solidify in the water to a very waxy substance - a little like a melted crayon. A good indicator of ambergris, rather than paraffin or palm oil, is the presence of squid beaks as squid form a significant part of the sperm whale diet but the beaks are indigestible. Think small parrot beaks and you won't be far from identifying the squid beaks. Garry McPhail has found this substance in Scotland recently. 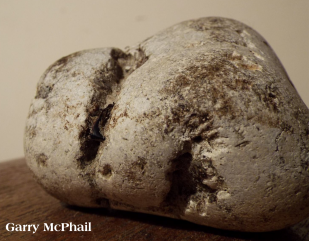 It certainly looks like ambergris (below), and there is what looks like a beak (left). He says it 'smells like the sea'. Garry had his ambergis tested by experts (he used a company called Ambergris Connect) and it definitely is ambergris. He's now looking for a buyer. 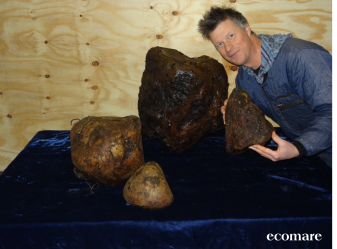 If you are looking to sell ambergris (or even buy it...!). there are web sites now that are set up to help you find a buyer, although they may charge a fee for doing so. Trading ambergris is currently legal in the UK (please check in case things change) but illegal in other places such as the United States and Australia. Of course, if you kill a whale to get the ambergris, rather than just pick it up from the beach, things will be viewed very differently, even in the UK. Please check before you trade - and make sure that local by-laws and the beach owners allow you to take items from the beach. 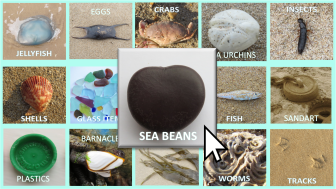 Click to browse our galleries of beach finds!